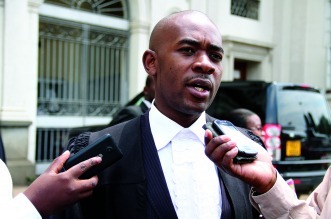 MDC Alliance presidential candidate Nelson Chamisa yesterday ratcheted up pressure for all parties to be allowed to monitor the printing of ballot papers for the July 30 general elections, saying the opposition would this time resist efforts to railroad them into a “sham” election. Addressing a campaign rally at Rudhaka Stadium in Marondera, Chamisa claimed they had gathered intelligence reports that Zanu PF had secured the services of Russian and Chinese nationals to rig the polls through manipulation of ballot paper printing and declared “we will never repeat the 2013 mistake”. “We are definitely going to agree on the issue of ballot paper printing. (Zimbabwe Electoral Commission chairperson Priscilla) Chigumba should be serious on that one. We do not want to print the ballot paper, but we need to monitor the printing and agree on the paper to be used. We know what they are doing with the Russians and Chinese. What they did to (Morgan) Tsvangirai will not happen to me. I am a prophet, young and have learnt. We will never repeat the 2013 mistake, ” he said. The opposition leader said the Wednesday demonstration will go ahead as planned and that if their concerns are not addressed, they would mobilise for daily protests until election day. “We are going to run this country and you will enjoy it. Even if we come back to you and ask for a second term, you will not refuse,” he said. Chamisa scoffed at State media reports that he was considering to appoint former First Lady Grace Mugabe as his deputy. “Saying that I will appoint Grace Mugabe as VP shows that they are aware of my victory. We respect (Robert) Mugabe because of his legacy, the positive things that he did. He is the first elected President and I am going to be the second one. “Mngangwa walked with Mugabe for 56 years, but they do not like him. I have not met Mugabe, but he did send a message, saying he will vote for me because I am his choice. A vote is not about age. Our government is totally a new with competent people,” he said. Chamisa also took a swipe at Zanu PF presidential candidate Emmerson Mnangagwa, saying the two weekends events where ruling party supporters were physically assaulted by the ruling party’s militia in Gokwe and Bindura proved that he was not a popular candidate. “You saw what happened in Gokwe and Bindura. People were beaten and forced to listen to Mnangagwa. The people do not want to listen to a beast but to a leader,” he said.